From the corner of the Black Stone to the Shaini Corner, it is 11.68 metres, including the door of the Holy Ka'bah. From the Yamani Corner to the Western Corner is 12.04 metres. 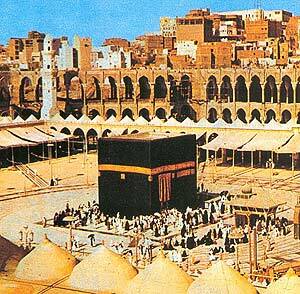 From the corner of the Black Stone to the Yamani Corner is 10.18 metres. From the Shami Corner to the Western Corner is 9.90 metres. According to the construction done by Abraham (peace be upon him), the height was 4.32 metres after the conversion to the metric unit. In the Quraish building, it was 8.64 metres high, and it was 12.95 metres in the reconstruction by Abdullah IN AI-Zubair (may Allah be pleased with them). The Caliph Abdul Malik Ibn Marwan retained the same height in the work done by Al-Hajjaj. AI-Sheikh Hussain Basalama mentions in his book `The History of the Glorified Ka'bah', that, with the grace of Allah, he measured the Holy Ka bah in metres from within on Friday 23rd Dhul Qa da, 1352 H. It was 10.15 incites long from the middle of the Yemeni wall to the middle of the Shami wall, and 8.10 metres from the eastern to the middle of the western wall. N.B. The standard length of the cubit is 48 centimetres.